"Hero." "Echoes of the Kennedys." "Very inspiring." "Good in every way." "Witty, charming, human, compassionate." You get the idea. 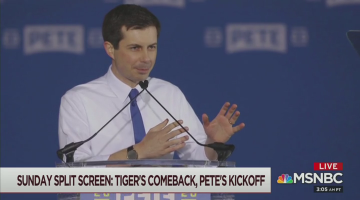 In the wake of his announcement speech of yesterday, today's Morning Joe was a veritable Pete Buttigieg love-in. In addition to Joe and Mika singing his praises, all the panelists joined in the chorus. And beyond the glorification of Buttigieg, there were pointed shots taken at the candidacies of Hillary Clinton and Beto O'Rourke. Donny Deutsch, who called Buttigieg a "hero," said that no one would have used the word for Hillary. And Mika suggested that "putting it kindly," Democrats "missed the mark last time around " by nominating Hillary. Brzezinski also complained that the notion of Beto O'Rourke as the Kennedyesque candidate has been "forced on me . . . you feel this sort of contrived candidacy." In contrast, claimed Mika, "Mayor Pete feels much more natural, real." Buttigieg is certainly having his media moment in the sun. The other candidates have undoubtedly taken notice. Somewhere, in dank campaign basements, oppo researchers are surely practicing their dark arts. How long before some unflattering item about Mayor Pete makes its way into the press? Note: I had to laugh at Scarborough's suggestion that along with watching Tiger's triumphant final round at the Masters yesterday, "everybody" was also watching Buttigieg's announcement speech. Perhaps--in some sections of the Upper West Side. But when the ratings come out today, the Masters will undoubtedly have been watched in gigantic numbers, with viewers of Buttigieg's speech were a tiny fraction by comparison, limited to Democrats watching cable news instead of golf.